Being aware of some basic first aid skills can mean that you take a bad situation and make it better - or at least stabilise the situation until help finally arrives. This 2-day (16 hour) wilderness first aid course, in Williams Lake, is excellent for any outdoor enthusiast, trip leader, family member, or resource worker who wants to take the guess work and panic out of a scary wilderness experience. We all know that a great day in the bush can turn into a nightmare when a backcountry emergency strikes. This hands-on course with Sheila Gruenwald does not require any previous first aid training. 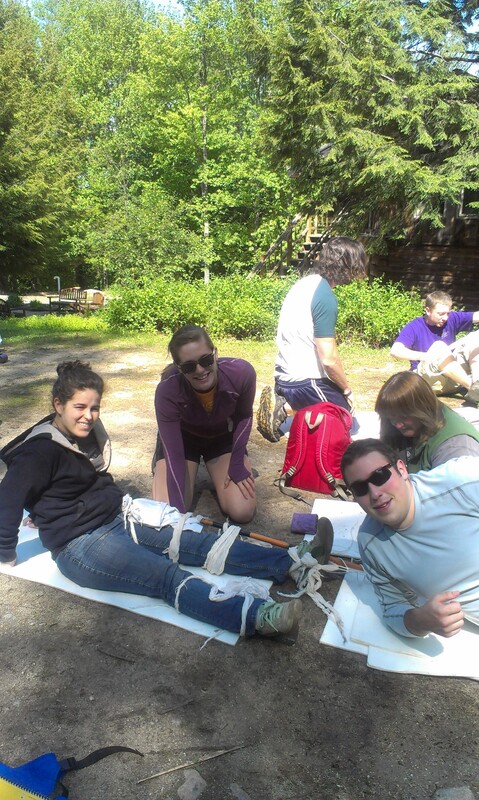 Sheila will get you practicing your improvisational skills as you figure out how to use the equipment you carry in your daypack, as well as any sticks or other elements in your environment, to create splints and both treat and transport an injured person. It's fun, and it really gets you thinking! You will be taught each skill and will have a chance to practice them in a fun and professional environment. At the end of the course may receive a SOLO WFA certification, good for two years. Most importantly, this training may someday save a life! Contact Sheila to register... ! Four spots left!